The bank lowered two key rates in an urgent effort to combat the threat of deflation. FRANKFURT, Germany – The European Central Bank has cut two key interest rates, one of them into negative territory – a highly unusual step that underlines the urgency of its efforts to keep the eurozone economy from sliding into crippling deflation. The monetary authority for the 18 countries that share the euro on Thursday added that it would later in the day announce further measures to make sure its low interest rates benefit the economy as much as possible. It reduced its main interest rate, the refinancing rate, from a record low of 0.25 percent to 0.15 percent. More drastically, it also cut the rate it pays on money deposited by banks from zero to minus 0.1 percent, an unprecedented step for the ECB that aims to push banks to lend money rather than hoard it. Stocks rose and the euro fell, to $1.3565 from $1.3600, after the announcement. The ECB is trying to spur a weak recovery and raise inflation, which is dangerously low at 0.5 percent. Weak inflation has raised fears the eurozone may slide into outright deflation, a sustained drop in prices that can choke off growth as consumers and companies delay spending in hopes of bargains. The eurozone economy grew only 0.2 percent in the first quarter, and unemployment remains high at 11.7 percent. 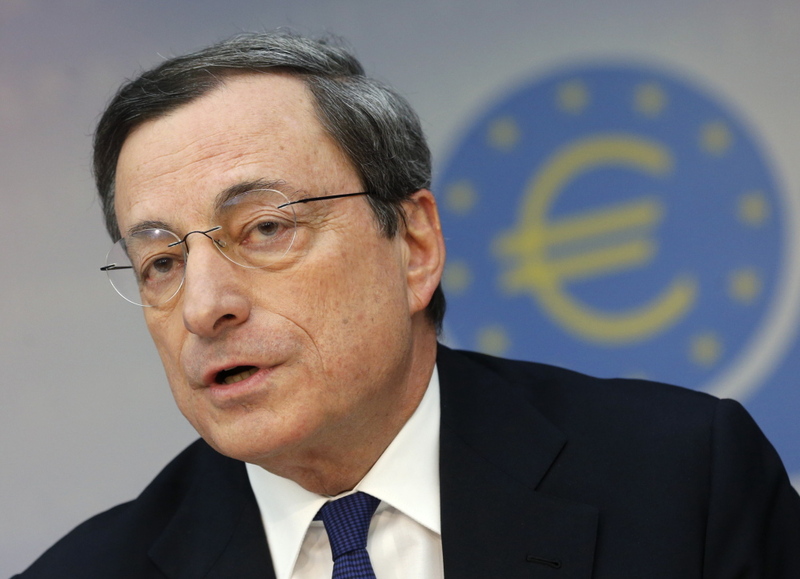 Investors were waiting for a post-decision news conference by ECB President Mario Draghi to see what the new measures will be to get credit moving to businesses. Draghi had all but promised lower rates, saying a month ago that the bank’s 24-member board was “comfortable” with taking action at the meeting in June and that it was “not resigned” to letting low inflation continue. Based on that, investors have sent the euro lower over the past four weeks in anticipation of the looser monetary policy, which tends to weaken a currency. It fell from 2 1/2 year highs around $1.40 in early May to $1.36 early Thursday. A lower euro helps the eurozone in two ways. It promotes growth by making exports more competitive. And it raises inflation by making imports more expensive, encouraging consumers to not put off spending. Lower ECB interest rates can help because they influence the rates at which companies and individuals can borrow, making it easier to get credit, spend and invest. The problem so far is that those low rates are not being passed on, because many banks have financial troubles themselves, or see little reason to lend. The negative deposit rate – that is, charging banks for parking funds with the ECB – is an unusual step never tried before in the eurozone. It has been attempted in Sweden and Denmark, which are outside the currency union, with mixed results. Economists say its impact in a larger economy like the eurozone may be unpredictable and note banks are often unwilling to lend for good reasons: fear they won’t get paid back in a weak economy. To fix that, Draghi is expected to announce at his press conference new measures that could include, among other things, a large round of loans to banks at low interest, on the condition that they increase their lending to businesses. Or, the ECB could try to promote such lending indirectly through financial markets. That could mean offering to buy packages of loans to small businesses in the form of bonds. That could stimulate interest in such bonds and give banks an incentive to make loans that they could then package and sell off at a profit. Yet the most effective step may not be taken. That would be large-scale purchases of bonds by the ECB using newly created money. Such a step would push new money into the economy, a step that can stimulate growth and, more importantly, inflation. The U.S. Federal Reserve, Bank of England and Bank of Japan have all made such purchases, dubbed quantitative easing. The ECB has held off, however, due to in part to doubts about whether it would be as effective in the eurozone, and over the complications of dealing with debt markets in 18 different countries.